"South Texans claim school districts withheld special ed" was first published by The Texas Tribune, a nonprofit, nonpartisan media organization that informs Texans — and engages with them — about public policy, politics, government and statewide issues. EDINBURG — Jean Gearhart and her husband Troy go to their five-year-old son's private school to change his diaper three times a day, and they won't be able to potty train him until he is eight or nine. Though their son is developmentally delayed, his parents say they can't enroll him in public school because McAllen Independent School District has denied him special education services for the past two years. The Gearharts and dozens of other Rio Grande Valley parents, educators and advocates filled a large meeting room Tuesday to explain to federal education officials exactly how their students missed out on special education services in their school districts. The U.S. Department of Education sent representatives to Edinburg to continue to evaluate whether the Texas Education Agency capped special education services after the Houston Chronicle published a report stating the agency was purposely excluding eligible students. Texas has one of the lowest special education rates in the country — 8.6 percent in 2016. The Texas Education Agency wrote a letter to the federal government in November saying it had not capped its services and that it is possible school districts misunderstood the rate as an absolute maximum. Edinburg was the third of five stops federal and state education officials planned on a tour to hear what Texans think of the state’s special education services. They held the meeting at the regional center for 38 school districts in the south Texas border counties. Parents on Tuesday claimed that school districts definitely misunderstood the federal law requiring them to give individualized services to all eligible students with disabilities. In the Rio Grande Valley — Region 1, according to the Texas Education Agency — 7.5 percent of students are receiving special education services, lower than the state average. In an area of the state that has the largest share of residents living in poverty, parents argued that school officials are not properly educated on what services they are legally required to provide students and have been actively denying them services they desperately need. Parents told officials of the personal burdens they shoulder in the absence of those services, with some quitting their jobs to become full-time advocates, caregivers and homeschoolers for their children. Schools lack money and knowledge to properly follow the law on special education, parents said. Arnold Chavez, a special education teacher, urged TEA officials to make sure schools are spending necessary funds on special education, instead of reallocating the money to other parts of the budget. “Do you have reason to believe it’s being spent on other services?” asked Gregg Corr, director of monitoring at the U.S. Department of Education’s special education services office. “Yes! Definitely,” several people called back. Speaking in Spanish through a translator, Bertha Garza told federal and state officials that she had trouble getting services for her autistic 14-year-old daughter and 12-year-old son as they transitioned from elementary to middle school in Mission ISD and McAllen ISD. She could not access information she needed in Spanish, her native language. The language barrier keeps many families from advocating for their children, said parent advocate Evelyn Cano. Instead of paying for the services of a professional translator, districts have staff members translate for parents during meetings to discuss a potential special education plan for students. Parents are “missing out on a lot of content,” she said. In the Valley, parents “tend to believe teachers are almighty. Whatever a teacher says is right. You don’t question them,” said Stephanie Contreras, executive director of the National Alliance on Mental Illness in the Rio Grande Valley. That raises problems when it comes to special education since many teachers do not have enough training or knowledge, Contreras said. “They don’t know the terminology and what actions to report to the counselors and nurses in order to get services for a child,” she said. Several parents who spoke Tuesday have students in McAllen ISD, in which 8.1 percent of students receive special education services in 2016 — again, lower than the state average of 8.6 percent. Gearhart sobbed as she told officials that her developmentally delayed son might be kicked out of his private school because of his potty training difficulties. And she claimed McAllen ISD officials said her son is too smart for special education. “I believed the school district was there to help me,” she said. But when she showed up to a committee meeting and saw they had hired a lawyer, she realized she would have to advocate for herself. Even after the Gearharts hired their own lawyer, she said, McAllen ISD said her son couldn’t have the services she wanted. “You can be the most well-prepared parent, the most well-prepared activist, and you’re still going to hit a wall,” parent advocate Vanessa Tijerina told officials in a spirited speech that far exceeded her three-minute time limit. Tijerina requested special education services for her son in fifth grade after being called to the school for his repeated behavioral problems. “No one mentioned anything about special education,” she said. Although she studied up before heading to the required committee meeting to determine whether her son qualified for services, she said district and school staff pressured her out of an individualized special education program. Beverly Ouellette showed up to Tuesday's meeting to get a direct answer from Texas Education Agency officials: Is her son, who has intellectual and developmental disabilities, required to take a foreign language to graduate from high school in two years? Corr passed the question along to the state education agency representatives sitting beside him. They told Ouellette to check the graduation standards on the agency’s website. Ouellette responded that she worried her son would join the ranks of students "ill equipped with real things they need to transition them into adulthood." As of Tuesday night, 177 comments had been added to the US Department of Education’s blog with feedback on special education in Texas. The tour ends in Austin Thursday evening. South Texans claim school districts withheld special ed By Aliyya Swaby December 14, 2016 EDINBURG — Jean Gearhart and her husband Troy go to their five-year-old son's private school to change his diaper three times a day, and they won't be able to potty train him until he is eight or nine. Though their son is developmentally delayed, his parents say they can't enroll him in public school because McAllen Independent School District has denied him special education services for the past two years. The Gearharts and dozens of other Rio Grande Valley parents, educators and advocates filled a large meeting room Tuesday to explain to federal education officials exactly how their students missed out on special education services in their school districts. The U.S. Department of Education sent representatives to Edinburg to continue to evaluate whether the Texas Education Agency capped special education services after the Houston Chronicle published a report stating the agency was purposely excluding eligible students. Texas has one of the lowest special education rates in the country — 8.6 percent in 2016. The Texas Education Agency wrote a letter to the federal government in November saying it had not capped its services and that it is possible school districts misunderstood the rate as an absolute maximum. Edinburg was the third of five stops federal and state education officials planned on a tour to hear what Texans think of the state’s special education services. They held the meeting at the regional center for 38 school districts in the south Texas border counties. Parents on Tuesday claimed that school districts definitely misunderstood the federal law requiring them to give individualized services to all eligible students with disabilities. In the Rio Grande Valley — Region 1, according to the Texas Education Agency — 7.5 percent of students are receiving special education services, lower than the state average. In an area of the state that has the largest share of residents living in poverty, parents argued that school officials are not properly educated on what services they are legally required to provide students and have been actively denying them services they desperately need. Parents told officials of the personal burdens they shoulder in the absence of those services, with some quitting their jobs to become full-time advocates, caregivers and homeschoolers for their children. Schools lack money and knowledge to properly follow the law on special education, parents said. Arnold Chavez, a special education teacher, urged TEA officials to make sure schools are spending necessary funds on special education, instead of reallocating the money to other parts of the budget. “Do you have reason to believe it’s being spent on other services?” asked Gregg Corr, director of monitoring at the U.S. Department of Education’s special education services office. “Yes! Definitely,” several people called back. Speaking in Spanish through a translator, Bertha Garza told federal and state officials that she had trouble getting services for her autistic 14-year-old daughter and 12-year-old son as they transitioned from elementary to middle school in Mission ISD and McAllen ISD. She could not access information she needed in Spanish, her native language. The language barrier keeps many families from advocating for their children, said parent advocate Evelyn Cano. Instead of paying for the services of a professional translator, districts have staff members translate for parents during meetings to discuss a potential special education plan for students. Parents are “missing out on a lot of content,” she said. In the Valley, parents “tend to believe teachers are almighty. Whatever a teacher says is right. You don’t question them,” said Stephanie Contreras, executive director of the National Alliance on Mental Illness in the Rio Grande Valley. That raises problems when it comes to special education since many teachers do not have enough training or knowledge, Contreras said. “They don’t know the terminology and what actions to report to the counselors and nurses in order to get services for a child,” she said. 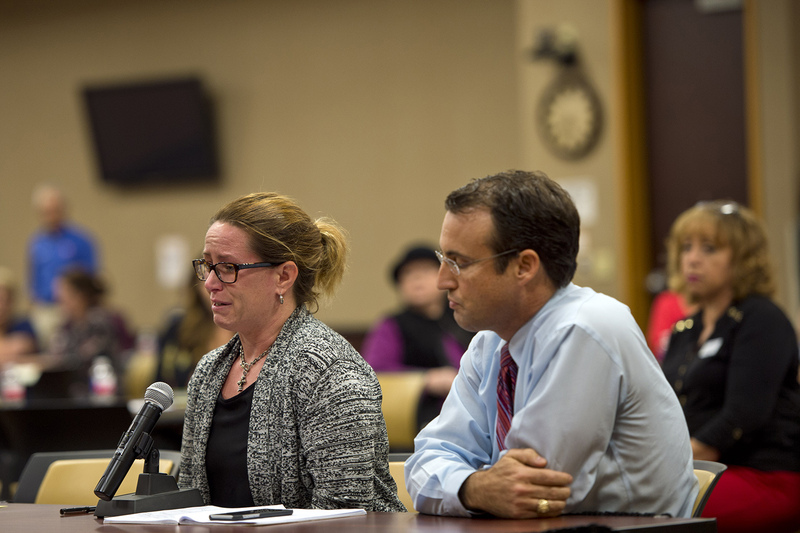 Jean Gearhart, alongside her husband Troy, gives a tearful statement to a panel about her special-needs child. U.S. Department of Education officials held a meeting in Edinburg on their tour of Texas to hear community members' experiences with special education.Eddie Seal Several parents who spoke Tuesday have students in McAllen ISD, in which 8.1 percent of students receive special education services in 2016 — again, lower than the state average of 8.6 percent. Gearhart sobbed as she told officials that her developmentally delayed son might be kicked out of his private school because of his potty training difficulties. And she claimed McAllen ISD officials said her son is too smart for special education. “I believed the school district was there to help me,” she said. But when she showed up to a committee meeting and saw they had hired a lawyer, she realized she would have to advocate for herself. Even after the Gearharts hired their own lawyer, she said, McAllen ISD said her son couldn’t have the services she wanted. “You can be the most well-prepared parent, the most well-prepared activist, and you’re still going to hit a wall,” parent advocate Vanessa Tijerina told officials in a spirited speech that far exceeded her three-minute time limit. Tijerina requested special education services for her son in fifth grade after being called to the school for his repeated behavioral problems. “No one mentioned anything about special education,” she said. Although she studied up before heading to the required committee meeting to determine whether her son qualified for services, she said district and school staff pressured her out of an individualized special education program. Beverly Ouellette showed up to Tuesday's meeting to get a direct answer from Texas Education Agency officials: Is her son, who has intellectual and developmental disabilities, required to take a foreign language to graduate from high school in two years? Corr passed the question along to the state education agency representatives sitting beside him. They told Ouellette to check the graduation standards on the agency’s website. Ouellette responded that she worried her son would join the ranks of students "ill equipped with real things they need to transition them into adulthood." As of Tuesday night, 177 comments had been added to the US Department of Education’s blog with feedback on special education in Texas. The tour ends in Austin Thursday evening. Read more: U.S. Department of Education and Texas Education Agency officials will hit five Texas cities to ask the public about their experience with special education, part of an ongoing investigation of the state's services. The Texas Education Agency denied allegations that it capped special education services for public school students at 8.5 percent in a letter sent to the U.S. Department of Education. "South Texans claim school districts withheld special ed" was first published at by The Texas Tribune, a nonprofit, nonpartisan media organization that informs Texans — and engages with them — about public policy, politics, government and statewide issues. Link back to the original article, which is located at https://www.texastribune.org/2016/12/14/south-texas-parents-advocates-claim-districts-with/.